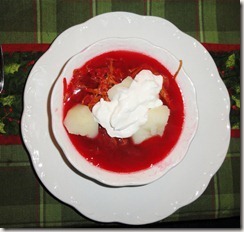 When my husband told me he ALWAYS has Beet soup on Christmas Eve, I said you mean Borscht. He said, No!, not Borscht, Beet soup, a traditional Eastern European Soup. Jon’s Polish relatives lived in Iron County in the Upper Peninsula of Michigan during the lumbering and mining eras. This was one of their favorite holiday or special occasion meals. Last year he presented me with the recipe that his maternal elder, Grandma Kolkoski followed. It has been neatly retyped from her hand written script and laminated to preserve it. 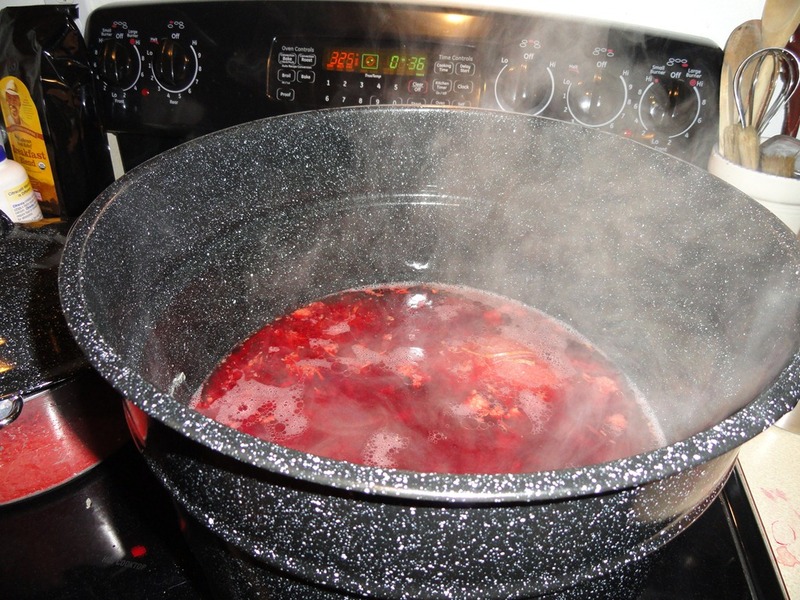 I “Googled” beet soup this morning to find out how beet soups compare. 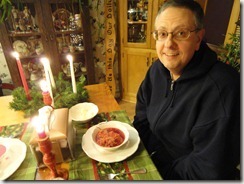 I found there is beet soup with and without meat,and with and without the following: tomato, carrots, and cabbage and beet tops. It can be served cold or hot and with crème fraiche, white vinegar, or sour cream. Its appearance can be a creamy soup, stew-like, or a clear soup. Meat, if used, can be sausage, wieners, ham, short or spare ribs. Some side ingredients that people may add to their bowl at the table are hot boiled potatoes, or mushrooms, or mushroom ravioli or tortellini, or sliced hard boiled eggs that are placed in the soup as it is eaten. 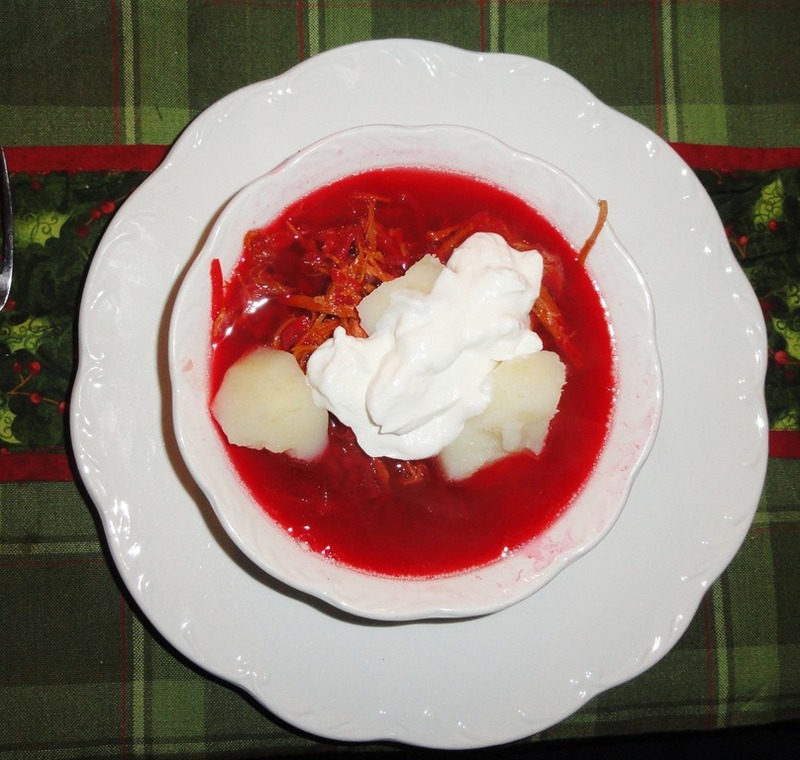 The Russian and Latvian beet soup is usually referred to as borscht. I found that Jon’s grandmother’s recipe last year, made a huge pot of soup. So we ate it for a few meals, then I cleverly froze it for his February birthday. The recipe I have is time consuming because everything, such as the broth base, is made from scratch. Shortcuts could be created easily, though. I will stick with the time honored method, because my auditor husband would probably detect the difference. I am looking forward to eating it tomorrow evening and Christmas day for supper. It is a very tasty hearty soup. If you have a hankering to make this soup, I have included the recipe below. Simmer 3 #Beef short ribs(preferred) or spare ribs with 1 tsp. salt for 2 1/2-3hrs in a large kettle. Meat needs to be covered with water. Skim off the foam as it comes to a boil. After 3 hrs., remove meat from broth. Let broth cool and skim fat off. Cut off all fat of meat and remove any bone. Chop meat into bite sizes and place back into broth. Add 4 cups of diced or shredded beets. If young garden beets are used, some of the lower stem can be chopped and added too. Simmer beets in broth for additional 1/2 to 1 hr. Just before serving, remove 1/2 cup of hot soup and stir into it, 2 cartons (I took that to mean a total of 16 oz, but not defined in recipe) of sour cream. Add this mixture back to kettle of soup. Add to kettle of soup, 2 Tbsps. of white vinegar or lemon juice, or crème fraiche. Do not boil soup after cream is added, as it will curdle. White pepper can be optionally used to season. Some people boil a couple of sausages or wieners in the soup or a slice of ham, depending on taste preference. At the table have hot, boiled potatoes, and more white vinegar, sour cream, or crème fresh for each person to add to their bowl of soup to suit their individual taste. A basket of fresh rye bread makes a nice addition to the meal.